Upon encountering the switch statement, C++ evaluates expression. It then passes control to the case with the same value as expression. Control continues from there to the break statement, which transfers control to the } at the end of the switch statement. If none of the cases match, control passes to the default case. The default case is optional. If the expression doesn’t match any case and no default case is provided, control passes immediately to the }. 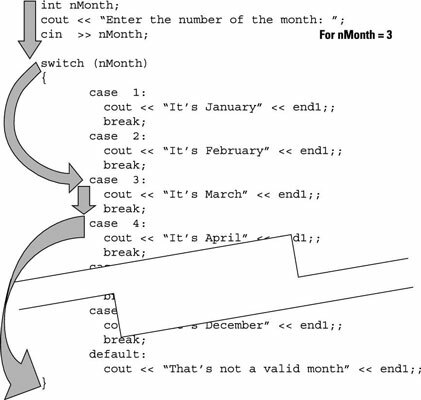 The figure shows how control flowed through the switch statement to generate the earlier result of March. Each of the cases must have a value at build time. The value of m is not known until the program executes. Actually, the 2011 C++ standard introduces a constant expression type that can be used as the target of a case statement.